And...it's finally peach season. Oh, sure, there have been peaches in the market for the last couple of months but they were just hard orbs with no fresh peach aroma. And I know from sad experience that they will never ripen. But now that it's August, the peaches are tender and fragrant, juicy and delicious. I wanted to use these beauties in a recipe that would leave them close to their raw state but just slightly softened and sweetened. So I decided to forgo the peach pie in favor of buttery, buttermilk shortcakes topped with peaches in a honey basil syrup and loaded with fresh whipped cream. Each component is delicious on its own but together, it's a heavenly bite. 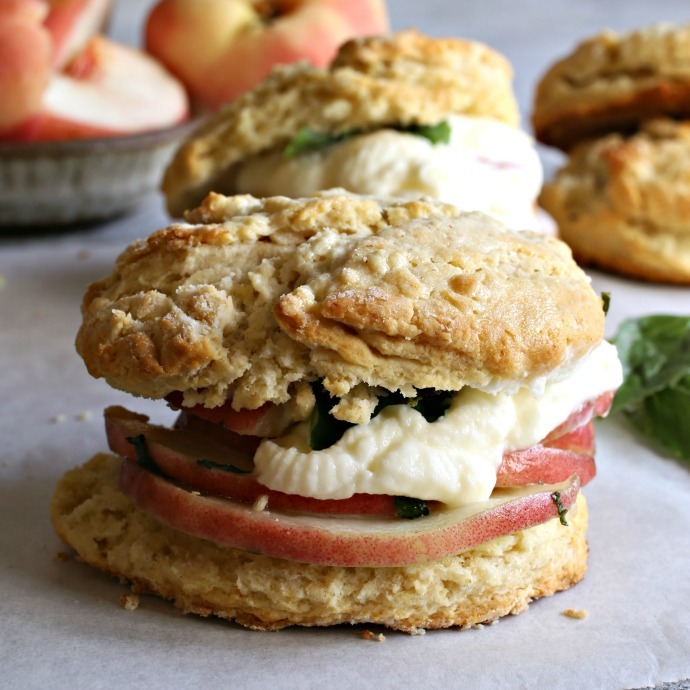 The hint of fresh basil adds such an interesting slightly savory note to the sweetened peaches and the biscuits are good enough to eat on their own with some jam. Or some of the whipped cream. Or both. Seriously, invite friends over because otherwise you'll be in serious danger of eating this whole thing by yourself. Enjoy! 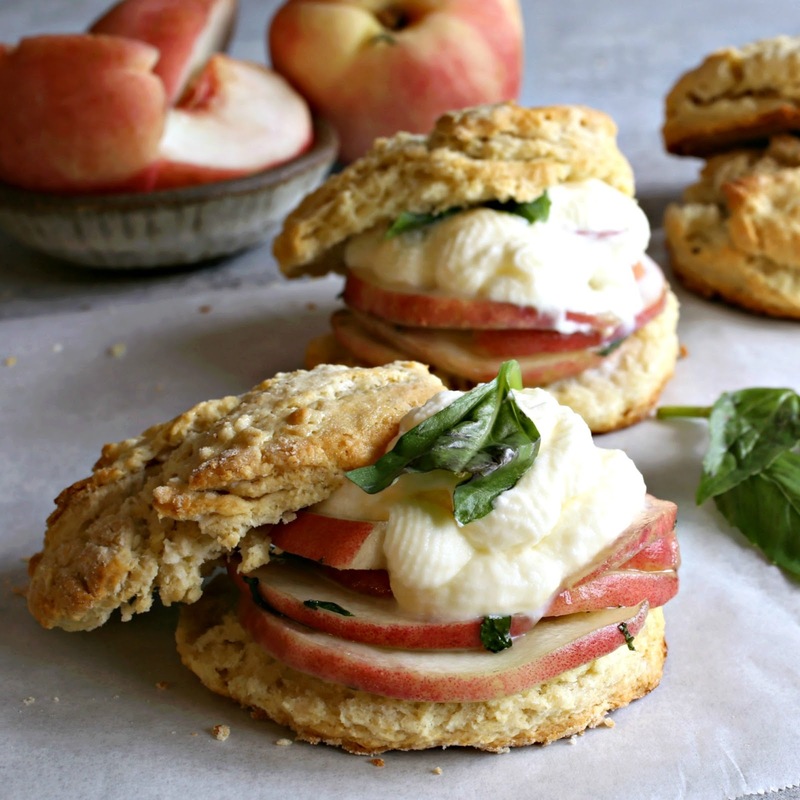 Recipe for individual peach shortcakes with sweet buttermilk biscuits and peaches in a honey basil syrup. Add the flour, butter, sugar, baking powder, baking soda and salt to a food processor and pulse a few times until the mixture resembles course crumbs. Pour in the buttermilk and pulse a few more times, just until combined. Turn the dough out onto a well floured surface and roll to 1" thickness. Cut out rounds using a 3" biscuit cutter and place them at least 3" apart on a baking sheet lined with parchment paper. Brush the tops with the heavy cream and bake for 20 - 25 minutes or until the biscuits are a light golden brown. Add the honey, sugar, water, chopped basil and salt to a pot. Simmer on low heat, stirring continuously, for a few minutes until the sugar dissolves. Remove from the heat and stir in the sliced peaches. Allow to cool. Add the heavy cream, sugar and salt to a bowl and whip using a hand or stand mixer until firm and set. 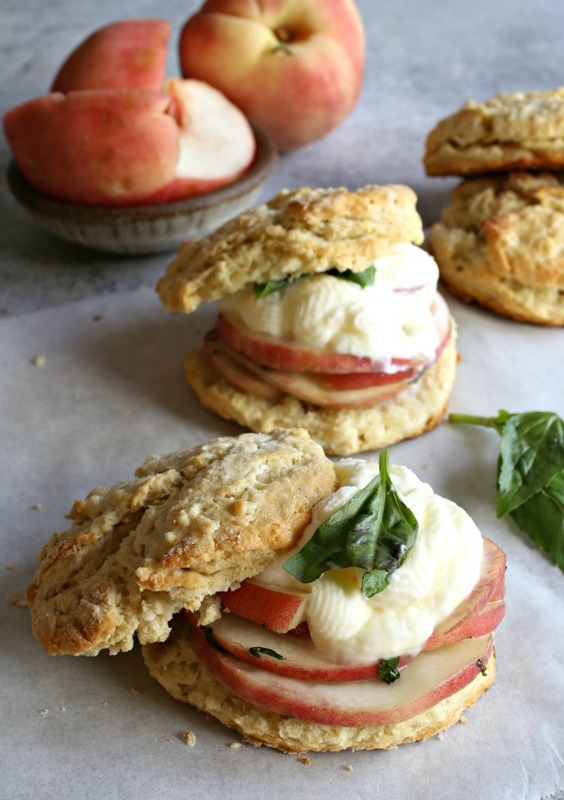 Assemble the shortcakes by slicing open each biscuit, layering sliced peaches on the bottom followed by a dollop of the whipped cream. Top with the other half of the biscuit.